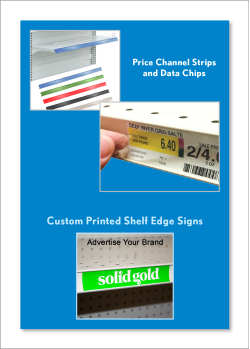 Price and Data Channel Chips and Strips | UPC and Price Shelf and Molding Labeling | Clip Strip Corp. Clip Strip Corp. is a leading manufacturer and distributor of Shelf Edge Price Channel CHIPS and STRIPS. Our standard heights are made to fit a 1.25" gondola shelf channels and lengths vary from 1.5" to 48". The chips come stock 2" with size variations between and up to 3" in clear but colors and other chip sizes are available upon request and the longer strips are stocked in 48" long versions in clear, red, black, blue, tan and green, and like Chips, other colors and lengths are available upon request. We also custom print logos and other brand or store section information on the longer strips, just inquiry with our customer service department. 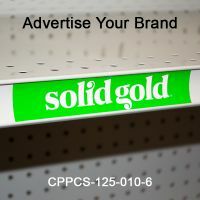 Chips enable you to move your pricing and UPC labels as needed and prevent label adhesive from sticking to the gondola, they make for great label holders. Channel molding strips are great way to gain attention at the point of purchase bringing life to the shelf edge enabling you to stand out in sea of shelving and retail displays. Minimum quantity for "Price Channel Chips, 2" Long x 1.25" high, 7.5 mil, PCHC-200-0075CL" is 250. Minimum quantity for "Price Channel Chips, 2.25" Long x 1.25" high, 7.5 mil, PCHC-225-0075CL" is 250. Minimum quantity for "Price Channel Label Holder Chips, 2.5" Long x 1.25" High, 10 mil, PCHC-250-010CL" is 250. Minimum quantity for "Price Channel Chips, 2.25" Long x 1.25" High,10 mil, PCHC-225-010CL" is 250. Minimum quantity for "Price Channel Chips, 2.75" Long x 1.25" High,10 mil, PCHC-275-010CL" is 250. Minimum quantity for "Price Channel Chips, 3" Long x 1.25" High,10 mil, PCHC-300-010CL" is 250. Minimum quantity for "Price Channel Chips, 2.5" Long x 1.25" high, 7.5 mil, PCHC-250-0075CL" is 250. Minimum quantity for "Price Channel Chips, 2.75" Long x 1.25" high, 7.5 mil, PCHC-275-0075CL" is 250. Minimum quantity for "Price Channel Chips, 3" Long x 1.25" high, 7.5 mil, PCHC-300-0075CL" is 250. Minimum quantity for "Price Channel Strips, STOCK COLORS, 48", PCHS-48-010" is 100.